A travel blogger from Sydney, based in Vancouver, who has lived abroad in New York as well as London and is obsessive over where to eat and drink. Check out my website at www.jesstours.com or follow me on instagram @jesstours. There is no better way to experience a city than to eat your way around it. And that is exactly what you'll do when you venture over to Vancouver's beloved Granville Island, and taste test your way around the island's iconic food market. Housed indoors and open from 9am to 7pm each and every day, Granville Island Public Market is home to a seemingly endless row of stalls, which overflow with perfectly ripe fruits, freshly baked breads and pastries, artisan cheeses, deli meats, fresh seafood, local wines, unique condiments as well as a variety of other foodstuffs. Once inside, it won't take you more than a few seconds to work out why Granville Island Public Market is regarded to be a top food destination in Canada, let alone in Vancouver. Indeed, the market is absolutely teeming with fresh, seasonal and local produce, ethnic diversity (you can find practically every type of food imaginable), high-quality fare, and a lively atmosphere. Not only that, but everything on offer (from the honey-dipped doughnuts to the sweet Italian sausages) is bursting with flavour. 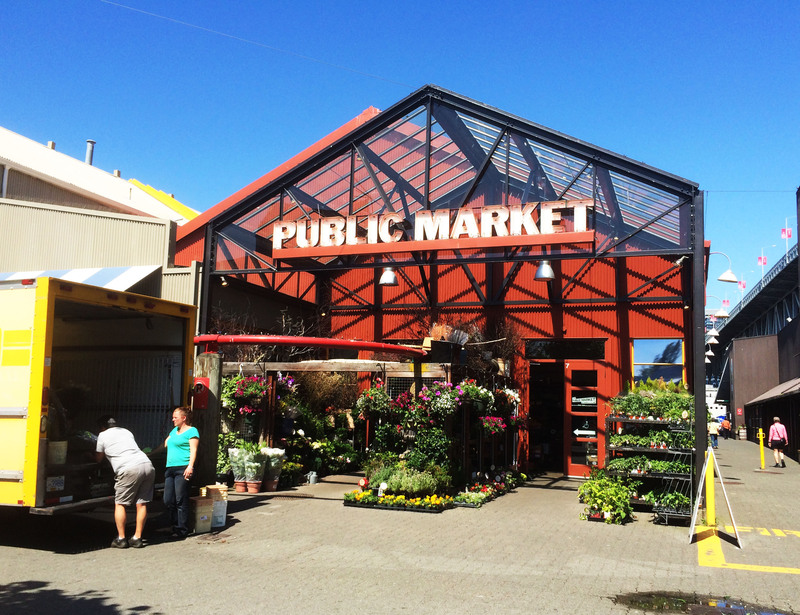 Therefore, a visit to Granville Island Public Market is an absolute must see, do and eat in Vancouver for any food lover out there. A fresh fruit and vege stand overflowing with produce. 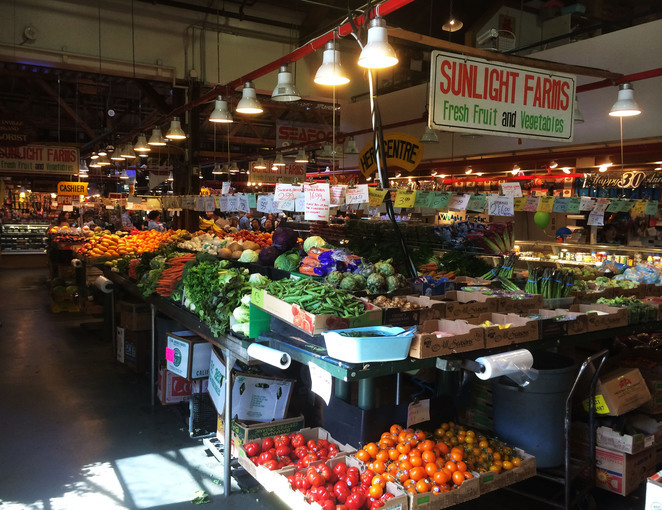 The market, which has been dubbed by many as the ultimate foodie experience in Vancouver is so popular with locals and visitors alike that it receives over ten million visitors a year. No matter what time of day you visit the market, I suggest that after a few cheeky laps around the stalls you head outdoors and find a sunny spot by the waters edge, where you can nibble away at your market purchases. In my books, this is a truly lovely way to spend a few hours. Not only is the food market a great spot to eat lunch, but it is also the perfect place to browse, pick up dinner or do a weekly shop. Thankfully Granville Island is a short boat ride (about 10-15 minutes away depending on where you board) from Downtown Vancouver. A boat ride over to the Island is a must. It must be said that nothing beats a trip over to Granville Island via one of the city's very sweet looking and gently moving ferries (otherwise known as a Vancouver Aquabus), on a summer's day. Not only do the ferries grant stunning sea views but they also provide market goers with a fun alternative to walking or catching the bus. A visit to Granville Island Public Market is an enjoyable and delicious way to explore and experience Vancouver, so make sure you put it at the top of your 'to do' list in Vancouver. You will not be disappointed. 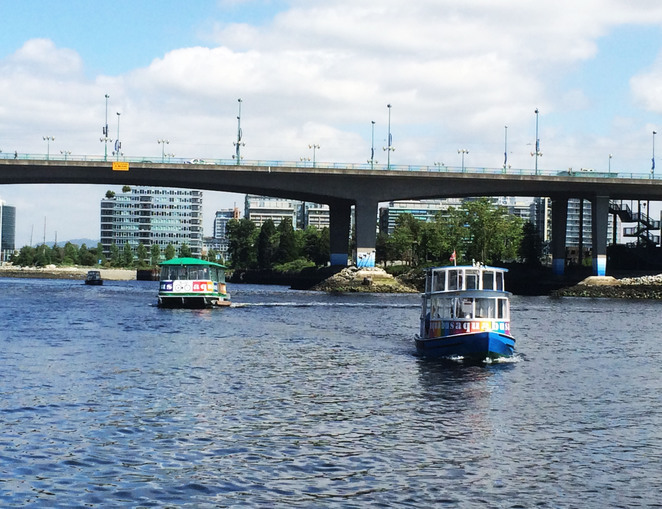 Tip: To avoid the bustling crowds on the weekend make sure you plan a visit to Granville Island during the week, where a much more relaxed setting is guaranteed. 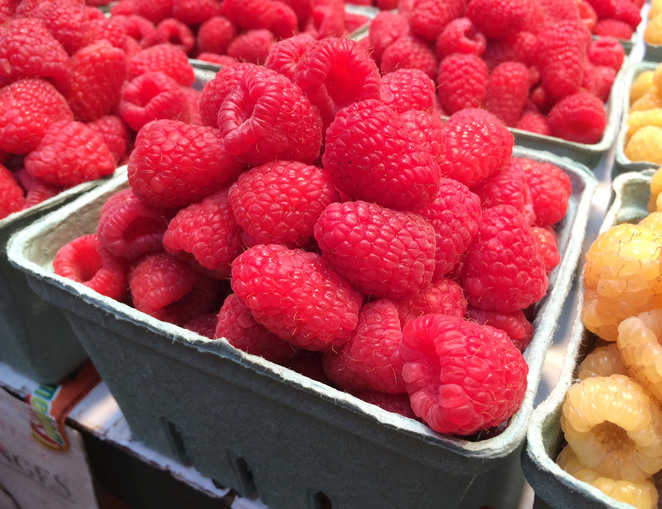 Honey dipped doughnuts sound nice, but those raspberries look wonderful too. Great place.